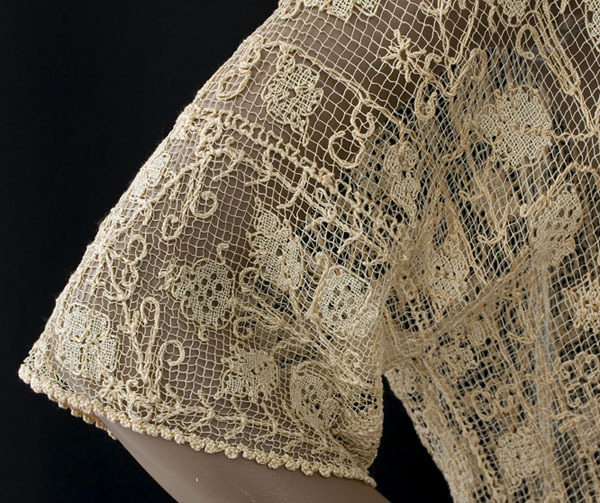 Knotted net lace, based on the technique used to make fishing nets, is perhaps the oldest form of lace making. 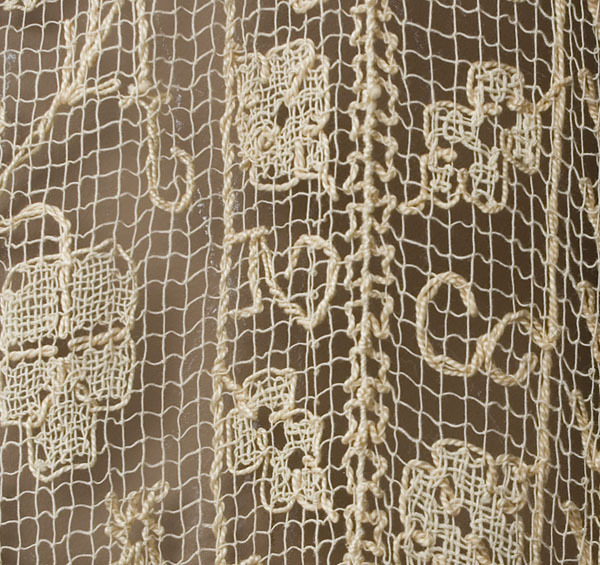 The decorative design is applied over the net ground with a needle. 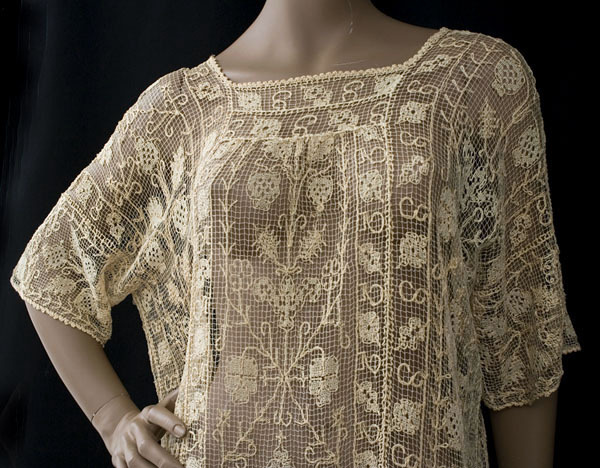 This tunic combines an ancient lace technique with a thoroughly modern T-shirt shape. 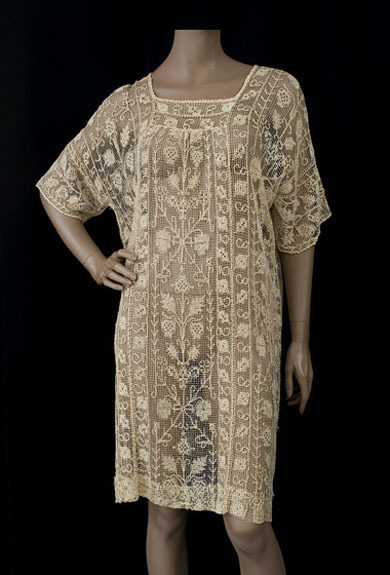 The style is as up-to-date as when first worn by an audacious flapper. Savvy collectors of vintage clothing have discovered that unique period pieces can give them the one-of-a-kind look of couture without the high cost. 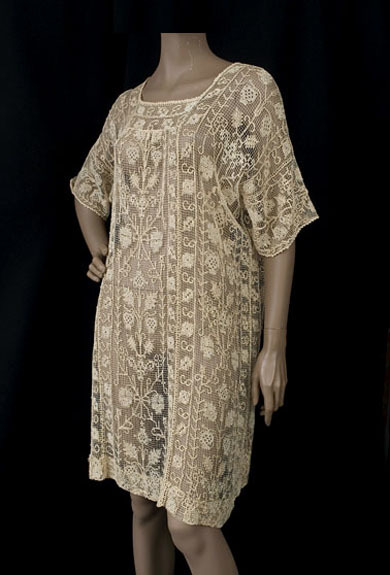 With this lovely tunic, you will have a unique garment of lasting beauty. No one will ask "who wore it better?" The ingenious symmetrical design is composed of semi-abstract natural motifs—many referencing the harvest time. The variegated, multiform motifs create an unforgettable panoply of masterful ethnic-style design. 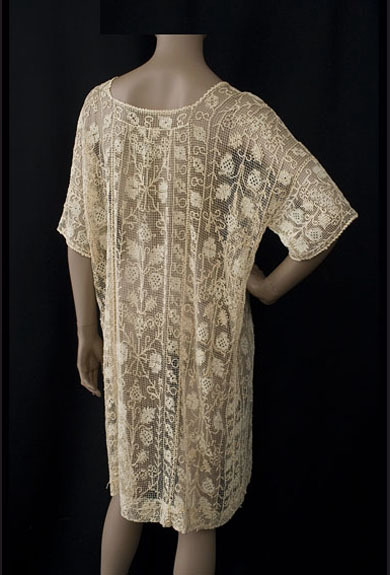 The tunic has been at the heart of high style fashion from the very beginning. This one tells the viewer that the wearer belongs to the aristocracy of style, a special cadre of fashion initiates whose smart attire always attracts admiring glances. Modern fashion was born in Northern Italy in the mid 14th century. Pisanello’s famous painting The Vision of St. Eustace (1440) shows St. Placidus out hunting. In the height of court fashion, he is wearing a close-fitting golden tunic edged with fur. Fast forward to 2009 at the runway show of cutting edge designer Tomas Maier (Bottega Veneta): his key look was the A-line T-shirt tunic. 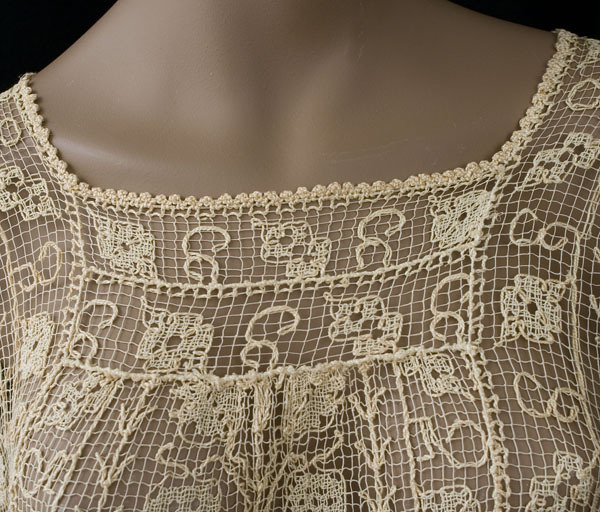 Fashioned from cotton yarn, the beige lace is washable by hand. The loose unstructured style fits a variety of sizes. It measures: 50" circumference and 37" from shoulder to hem. Photographed on a mannequin that measures 36" bust, 25" waist, and 36" hip.